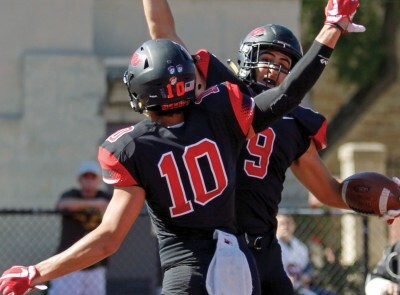 Mher (left) and Sasoun Tcholakian are starting receivers for the Bishops. 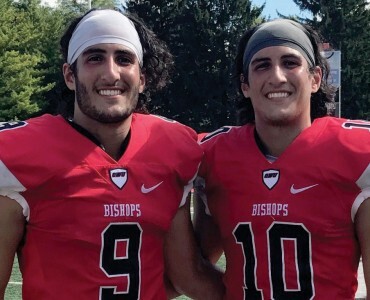 For twin Battling Bishop football players Mher and Sasoun Tcholakian ’20, the best things come in pairs. The brothers get plenty of time together on the field and in the classroom — they’re both wide receivers on the team and double (of course) majors in sports management and business marketing. Sasoun hopes their work ethic inspires underclassmen on the football team. Because players must maintain a certain grade requirement to be on the team, coursework and fieldwork are closely connected. “Football teaches you hard work and dedication, and that is how I take my academics. The coaches are always on us about getting good grades, and I want to show the young guys that it is important to work hard on and off the field,” Sasoun says. Head Coach Tom Watts and the entire football staff enjoy the twins’ contagious energy, dedication to make everyone around them better, and athletic talent. They have both started for the team for the past two years. “They truly change the culture of a team, in a good way, just because of their character,” says Watts. “They are extremely hardworking, dedicated brothers who we always know we will get 100 percent from. The twins hope to translate their classroom and field experiences to sports broadcasting after graduating and already have a podcast about college football called “Double Time.” They also have a YouTube channel.